What makes an attractive, pleasing smile? In answering this question, most people would make some mention of white teeth. Various products and procedures exist improve the colour or ”whiten” the teeth. When looking to enhance your smile, whitening teeth can be considered quite conservative and offers good value – compared to other methods of improving a smile (such as braces, veneers, fillings, etc.). The desire for whiter teeth has seen an increase in the availability of over the counter products, blogs spruiking ‘natural’ alternatives, dentists marketing in every available medium and even beauty salons entering the market. So what actually works? We are asked on a daily basis “how can I make my teeth whiter” so here are the ways to do it. Firstly, we’ll take a look at over the counter products, or those you can find on supermarket shelves and pharmacies. These whitening products come in a variety of mediums including pastes, mouth rinses, strips and so on. Supermarket shelves are now stacked with toothpastes offering whitening results. Every toothpaste brand will have one or more “whitening” variations. So do these work? Yes and no. The main difference with these toothpastes is that they will contain more abrasive particles and other products to lift surface stains from the teeth. Surface stains may include tea/coffee stains, red wine, smoking and others. The actual bleaching effect is likely to be minimal – there are strict regulations that allow only small amounts of peroxide in toothpastes. In a nutshell – if you regularly develop surface stains from habits such as daily tea drinking, a whitening toothpaste may help remove these stains and thus make your teeth appear whiter. Unfortunately, it is not always surface staining that makes our teeth look less appealing than what we would prefer. Deeper staining ‘within’ the teeth will not alter from the addition of an abrasive, and in these cases – bleaching may be indicated. We all love an affordable, convenient solution. Whitening strips offer these attributes and may provide a decent whitening effect. Whitening strips are also available over-the-counter. We would still recommend you consult a dentist before considering use of a bleaching product. Strips contain a form of peroxide – either carbamide peroxide or hydgrogen peroxide, in a percentage that is safe to use at home. Before considering the two options listed above, we generally recommend discussing your options with the dentist at your routine check-up and clean appointment. This way we can tailor a solution to your particular situation. Each situation is unique and what’s appropriate for one person is not always appropriate for the next. For example, your teeth may be looking darker when you smile, and so you go and try an abrasive toothpaste for 3 months. The problem is that your teeth are looking darker due to acid erosion and thinning enamel. The abrasive toothpaste will only make the situation worse! And potentially result in sensitive teeth. Professional teeth whitening is another option. We recommend (where appropriate) a take-home bleaching system. This involves fabrication of custom made trays (like a thin mouthguard) which are used to carry the bleach solution. Like the whitening strips, the bleach solution consists of either Carbamide Peroxide or Hydrogen Peroxide – the difference being we can provide the strongest percentage available. For this reason, the results can be much more drastic. Used on the right person, take home bleaching can have profound results. To see if you are suitable, we just need a short appointment to assess your teeth. Then we can take some moulds of the teeth and a technician will fabricate your custom trays. We then provide you with the trays and a tooth whitening kit. The best thing about having custom trays is that you can keep them for years and re-bleach when you like. The cost of professional teeth whitening at Bay Dental Brighton can be found in our pricing section. Remember – not everyone is suitable for this treatment, so we need to assess your teeth first. We can discuss alternative methods if you are not suitable. 4. Back to Basics – the most important way to keep your teeth shiny and white. Not only will you prevent dental disease (decay, gum disease, etc) but you will keep your teeth looking youthful and white. We see a lot of stain between teeth – so don’t forget to floss daily or use an interproximal brush. Brush with a soft toothbrush or use an electric toothbrush. The ‘Sonic’ types of electric toothbrush may remove more surface stains than conventional electric toothbrushes. Maintain a diet that is low in acidic food and beverage. We commonly see teeth ”yellowing” as a result of thinning enamel. Thinning enamel can be a result of a diet high in acid – causing loss of tooth structure. Once enamel is lost, it is gone forever. The tooth under the enamel is yellow, thus will become more prominent as the enamel thins. The result is yellower teeth, and a situation that is more difficult to rectify with standard teeth whitening methods. Your teeth will become ‘naturally’ whiter after a professional scale and clean. This will remove all plaque, calculus (yellowish hard build-up) and surface stains. Not to mention the main benefit of a clean- to ensure healthy gums and prevent dental disease. For stubborn or widespread staining, we can use an air abrasion system – prophyflex. Contact Bay Dental Brighton for an appointment today. We are happy to discuss the most appropriate whitening treatment for your teeth. Does my tooth need a filling? What you need to know. Dentists (like us) like to harp on about getting regular check-ups and preventative care. Diet – not just low on sugars but low in dietary acids (those found in soft drinks, juices, etc). Saliva – good quality saliva provides significant protection to the oral tissues. Other factors – fluoride (preferably in contact with the teeth soon after they erupt into the mouth), bacteria levels in mouth, etc. Unfortunately, most people aren’t so lucky and may require one or many fillings throughout their life. Yours truly has five fillings – related to a significant consumption of a sugary cereal during school years. So how do you know if you need a filling? You will have pain, correct? Unfortunately, this is most often not the case. Dental disease (whether it be decay or gum disease) has the inconvenient trait of being almost painless or mild in its early stages. So if you haven’t been to the dentist in years, get in quick! Dental decay generally becomes painful by the time it hits the nerves, ie. Very deep! By this stage, sometimes a ‘filling’ is not possible and more extensive treatment is required – such as root canal treatment or tooth extraction. On occasion, a smaller cavity will be noticed if the tooth chips or fractures, or if food starts to collect where it never used to. Some cavities will get sensitive when you have a hot or cold drink. This patient came in for a routine checkup. It had been many years. She had no complaints, no pain, just some bleeding from the gums. The first photo shows the tooth (top left molar) as it sits in the mouth- all good yeh? An x-ray was taken and a large cavity found. The tooth was opened up and look what was underneath! This patient was very lucky in that we provided a filling for this tooth and so far so good. Due to the size and depth of the filling, the tooth may need future work- either root canal or extraction. If picked up earlier, a simple (and a lot smaller) filling would have done the trick! Don’t put off your check-ups – 6 monthly checks and regular x-rays (very 1.5-2 years) are the best way to prevent dental problems and catch things early. Most dental disease is painless until it is a long way advanced! If you think you need a filling or have been told you need fillings, don’t delay! They will not spontaneously heal and delaying can lead to bigger cavities, longer term problems, more time in the dental chair and significant financial burden. I only want white fillings. That’s great, we only place tooth coloured (white) fillings. The material of choice that we use is called “composite resin”. It is a great material for most situations. We do not use dental amalgam due to concerns regarding its mercury content and the fact that NOBODY has ever requested a black filling. 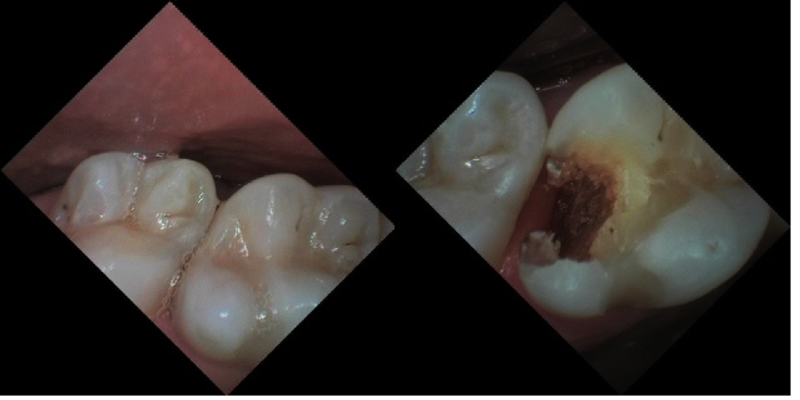 Sometimes composite is not strong enough for very large fillings. We can then recommend other types of fillings or tooth restorations (eg. Ceramic or porcelain crowns). Rest assured we can always use tooth coloured materials. We recommend only replacing amalgam fillings if there is a legitimate reason to do so. This may be because of decay under the filling, cracks in the tooth or filling or cosmetic concern. Removal of amalgam fillings when there is no good reason to do so can weaken the tooth, irritate the nerves of the tooth and lead to other problems. If you would like to remove your amalgam fillings, we are quite happy to discuss the pros and cons with you. This is largely dependent on the individual and their lifestyle/habits. A well placed composite filling should last a minimum of 5-10 years. They are quite capable of lasting a lot longer under the right circumstances. There is an absence of factors such as a grinding/clenching habit, nail biting, etc. It has been placed well by the dentist! Unfortunately, a really well placed, perfectly sculptured filling will fail at about the same rate as an average placed filling if there are dietary, oral hygiene or other factors at play. If recently done, a filling may stay sensitive for a few days. Your tooth has just be traumatised and takes a while to recover. We generally tell our patients to expect some mild sensitivity for up to a week after placement. This is usually not the case and most people report no problems at all. Sometimes fillings will remain sensitive for longer periods and you should then contact your dentist. If you have an old filling that has recently become sensitive, go to your dentist ASAP. Your old filling may be failing – it may have new decay under it, it may no longer join the tooth properly or the nerve could be irritated. The cost of fillings varies based on how many surfaces it will need to cover. It also depends on the material used and the tooth involved. As a rough guide, see our pricing page. Obviously, we need you here to give you a correct quote. A full, thorough examination with x-rays is recommended prior to undertaking any fillings. This way we can get an overall picture of your teeth and find out why you require treatment and what we can do to reduce your risks of further problems. In a nutshell, be kind to your teeth and hip pocket by taking a preventative approach to your dental health. Regular dental checks and avoiding delays with treatment will keep you in good shape. Call Bay Dental Brighton for an appointment today! Veneers – Everything you need to know to smile with confidence! Ever wonder how or why most people on TV have amazing smiles? Not everyone is blessed with the perfect set of pearly white teeth – change is possible! In fact, most people have some aspect of the teeth or smile that they would like to change – this can be a major gripe or something very minor. Dental veneers are one form of treatment that can provide you with a confident and beautiful smile. A dental veneer is essentially a thin shell of material that is placed over the outside surface of the tooth. This shell or cover is custom-made to fit your tooth and can be altered in order to change the shape and colour to create your ideal smile. That’s the crux of a veneer – we can vary the size, shape and colour of the veneers to provide an aesthetically pleasing result. In general, porcelain veneers would provide the most life-like and natural improvement. These veneers are constructed in a dental laboratory by an experienced technician who specialises in porcelain work. At Bay Dental Brighton, we stick to using reputable Australian laboratories for quality assurance. Composite veneers will generally have a shorter lifespan but are quite capable of lasting 10 + years. One downside of composite veneers are that they tend to discolour over time and can stain at the junction of the tooth. Tooth preparation- One of the benefits of veneers vs caps or crowns is the limited amount of tooth preparation required. Porcelain veneers generally require just 0.5mm of tooth removal from the outer surface. The idea behind aesthetic veneers is to utilise your own tooth structure to give the veneers vitality and a lifelike quality. Following tooth preparation, moulds of your teeth are taken and sent to the dental laboratory. The dentist will then construct temporary veneers to be worn while the porcelain veneers are made (usually 2 weeks). The price of porcelain veneers can vary significantly depending on the quality of dental laboratory chosen by the dentist. Some dentists will choose a cheaper lab and this is usually reflected in the quality of the work. At Bay Dental Brighton, we insist on using only the best local Australian dental technicians and ceramists. There is no substitute for quality. We often ask that our patients attend the lab for ‘shade taking’ – this allows you to discuss your expectations directly to the dental technician. For a rough guide on pricing, please view our website tab Pricing. Use this as an estimate only- a specific quote will be provided following a dental examination to assess suitability for porcelain veneers. We often find that the best results are achieved by fewer veneers. This can involve a combination of deep bleaching of the other teeth (tooth whitening) followed by veneers that match the bleached teeth. Other times, bleaching cannot get us to an acceptable colour shade so it is necessary to veneer these teeth also. If you are interested in veneers, call our friendly staff on (03) 9596 2092 to arrange a consultation with one of our dentists at Bay Dental Brighton, located near Melbourne. You can visit also book an appointment online here.